Glass Tube Vs Solid State CO2 Fractional Laser. At Areton Ltd we are the only UK company providing both Glass Tube and Solid State solutions to our customers and openly explaining the differences between the two technical solutions. The state of the art technology of Fractional CO2 lasers offers two main ways to generate the laser beam. One is by using the glass tube generator and the other is by using the solid state laser generator. The two solutions have their advantages and disadvantages. In this page you will be able to understand the difference between the two solutions and be equipped with the right information in order to make an intelligent decision when choosing one arrangement versus the other. What is the Glass tube CO2 Laser and why? Historically, the classic way to generate the CO2 Laser beam has been by using a glass tube generator. This has only one upside, the lower initial cost advantage. This is because CO2 laser glass tubes are a mature technology, widely available and relatively inexpensive to purchase and implement into a fractional CO2 Laser System. The Glass tube requires the constant use of clean water for its normal cooling for its correct operation. This is the main disadvantage of this solution. Because this makes the water change a maintenance routine and an ongoing cost. Also the presence of water into the system means that there are potential breakages due to the low temperatures of of certain environments. When the temperature of the environment drops below zero degrees Centigrade the water inside the system can freeze and hence cause cracks into the glass laser tube. The main why is the lower cost of the component and its implementation into the laser system. Solid State CO2 laser Component to a CO2 Fractional Laser. What is the advantage of a Solid state CO2 Laser Beam Generator? The main advantage is the maintenance free nature of the component and consequently the overall system. 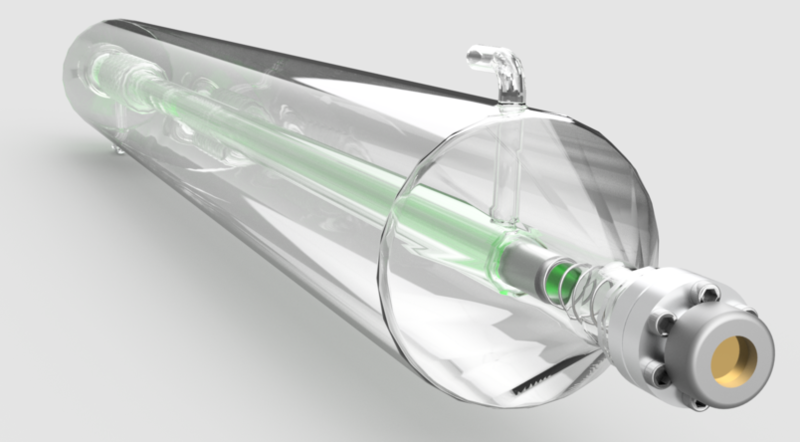 The CO2 Laser can be left at room temperatures below zero without the inherent potential for breakage of the water sytem inside the glass tube. Therefore this make the Solid State CO2 Laser practically maintenance free. The lser solid state component is a more durable than the classic Glass Tube Laser generator. This is not because the Glass tube is “per se” subject to wear and tear (which is not the case), but because the device is virtually maintenance-fee and the solid state component is not subject to breaking or cracking as a glass tube is during low temperatures or transport. The ambient temperature can drop below zero degrees Centigrade. This is because the water inside the glass tube will freeze and cause unwanted breakage into the glass tube and hence causing coslty damage. The usual way to repair such breakage is changing the glass tube. The clinic owner does not want to implement a periodic routine maintenence of the laser. This is because the Glass tube laser arrangement requiresthe water inside the laser system to be changed on a monthly basis for its correct use. The only downside to the solid state arrangement is the extra cost of the device arrangement.